Getting to Sunshine is easy via all forms of transport. 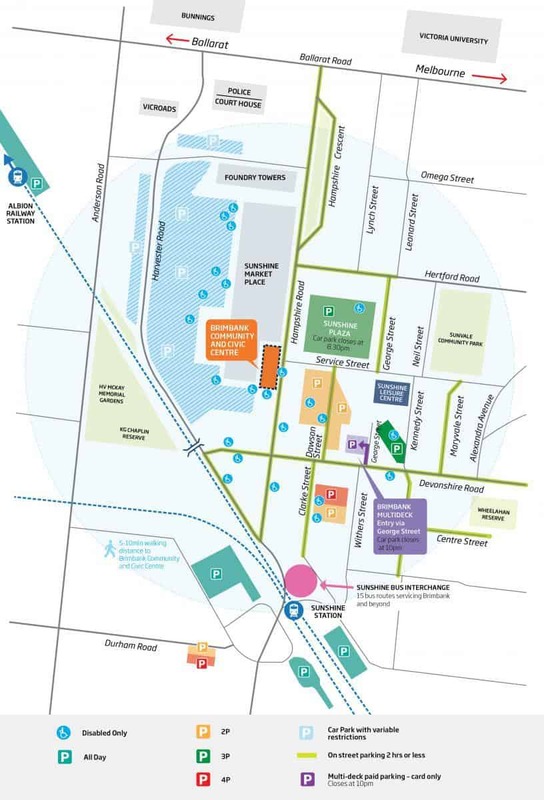 Sunshine CBD is 12 km from Melbourne with plenty of FREE parking, a bus interchange and a premium train station in the heart of the shopping precinct. Public transport is the best way to get to Sunshine. Sunshine is connected to Melbourne and the west with 18 bus routes that terminate or travel via Sunshine. 4 buses travel along Hampshire Road stopping at the Sunshine Marketplace and Sunshine Plaza shopping centre front doors – 220, 408, 903 and 942. If you are travelling by car to Sunshine most car parking is free with restrictions of 1-2 hours along Hampshire Road and side streets. The best parking with 3 hours limits is around the Marketplace on Harvester Road and under the Plaza – entry via Service St or Hertford Rd. There is free 1–2 hour free parking in Clarke St and Dawson St. A new MULTIDECK car park in George St allows you to park all day for just $4 payable by card only and closes at 10pm. Durham Rd Sth Sunshine has 2-4 hour carparking. Both sides of the train station has all day car parking areas.